EDINBURG — While city leaders here mull their financial commitment to the proposed county courthouse, talk about moving the building to another city is starting to circulate. Such a move, however, is not as simple as it sounds. 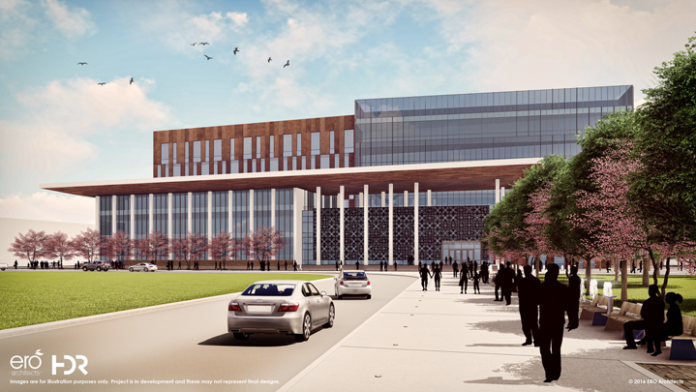 Edinburg was supposed to be the county’s biggest ally in the construction of a new courthouse, offering to pay about 20 percent of the estimated $150 million price tag. But that informal agreement was forged almost two years ago — when Edinburg was led by a different administration. At the time, city leaders thought the agreement would quickly be put to paper and estimated construction of the courthouse would soon be underway. Perhaps the sentiment is best described in a Monitor article dated Feb. 2, 2016. “If both parties agree on the MOU (memorandum of understanding) and keep meeting deadlines for the project, construction could begin before the end of the year and culminate with a move-in date of Oct. 1, 2018,” the article stated. But things did not pan out that way. While an MOU was drafted and signed by both entities about 10 months later in December 2016, the document is not legally binding, and therefore not enforceable. Now, county leaders want Edinburg to sign an interlocal agreement to finalize the deal. An interlocal agreement, in contrast to an MOU, is considered legally binding. But Edinburg’s new leaders appear to be hesitant to commit $30 million over the course of 30 years, which would add up to about $45 million once interest is accrued. Critics, however, argue that the city’s new leadership is purposely stalling the project for political purposes. But Molina, a former council member who successfully challenged former Mayor Richard Garcia for the seat in November, says that’s not the case. And while Edinburg and the county squabble, at least one other city seems poised to offer help. Should communication breakdown between the county and Edinburg, Pharr would be willing to step up to the plate, Pharr commissioners told Hidalgo County Judge Ramon Garcia during a public meeting last week. The extent of Pharr’s support was not discussed at length, but commissioners alluded the city would be willing to house the new county courthouse should Edinburg withdraw support for the project. Pharr Mayor Ambrosio Hernandez said Wednesday that Pharr would be willing to house the courthouse “if, and only if” Edinburg, by its own volition, decided to withdraw. But Pharr is not the only city interested in the $150 million facility. “I’m not going to single out Pharr, but they’re not the only ones,” Molina said, referencing other municipalities willing to vie for the courthouse. The Edinburg mayor, however, doesn’t think it’s a viable option. Moving the county courthouse would mean moving the county seat, and state law details a specific process for the proposed move. Chapter 73 of the Texas Local Government Code outlines the process. It states an application must first be submitted by registered voters before a relocation election can take place. “ … If the county seat has been established in the same location for more than 40 years, a majority of the … qualified voters of the county … must make the application,” the law states. Hidalgo County’s seat was initially located in Hidalgo, but was moved in 1908 to Chapin, which was later renamed Edinburg. Currently, there are more than 338,000 registered voters in Hidalgo County — which means about 169,000 people would have to sign a petition in order to get the issue onto a ballot. The Hidalgo County Metropolitan Planning Organization has already allocated $20 million to improve the infrastructure surrounding the courthouse square. The improvements are meant to fix decades of issues related to poor infrastructure, such as periodic street flooding. The MPO board allocated the money to the project, in part, because of the plans in place to build a new county courthouse, Hidalgo County Precinct 4 Commissioner Joseph Palacios said. But while the project was a factor in the decision, the allocation was not contingent on it, Palacios said. The county commissioner, who also serves as vice chairman of the MPO board, said he would continue to advocate for the current allocation of the funds regardless of any future decisions. “The courthouse is just one of the many areas that we have in the square, and I’m committed to continue to advocate that the funds remain for the Edinburg downtown area,” the county commissioner said. But it’s not entirely up to him. “To re-allocate or move any funds from one project to another would require a vote from the entire MPO board,” Palacios said. All parties say they hope an amicable agreement can soon be reached. Hernandez, the Pharr mayor, echoed the sentiment. “We wish it nothing but success,” he said. Palacios also hopes for the best. “My hope is that we continue to work with our partner without having to go back out and look at other alternatives,” he said. The new Edinburg city council is not against the courthouse, Molina said. Council members just want to do their due diligence. “We’re just trying to get our ducks in a row and make sure everyone is caught up before making any agreement,” he said.